Parahit f/Parahit Total | ARKRAY, Inc. Rapid Visual Immunochromatographic Test for Qualitative Detection of Plasmodium Antigen in Whole Blood. An antigen detection assay that detects P. falciparum specific histidine rich protein II (PfHRP II). 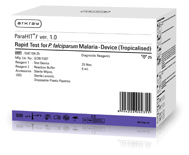 An antigen detection assay that detects P. falciparum specific histidine rich protein II (PfHRP II) and Pan malaria species (P. falciparum, P. malaria, P. vivax, P. ovale) specific aldolase.